What is a false conversion? I have seen a recurring theme lately on social media sites… the false conversion! These social media posts, videos, images, and websites are claiming that a false conversion is when people think they are Christians (or saved), but in reality, they are not. Why wouldn’t they be saved? It’s not because they don’t believe Jesus died for their sins, it’s because they aren’t doing the things Christians ought to do. This means these false converts are somehow openly sinning in a way that Christians should never do, they aren’t bearing the proper Christian fruit in their lives, or they think that a prayer that they said at some point means they are absolved of all their sins. The other recurring theme I am seeing amongst these posts that talk about false converts is a question of “true repentance”. They claim that a false convert hasn’t truly repented, or hasn’t really surrendered to God, or doesn’t actually desire a relationship with God, they’re just wanting “fire insurance”. An example of this false conversion talk. “He’s speaking about how people are very quick to get someone saved that they basically never tell the the gospel but rather spend five minutes and make them mouth a sinner’s prayer. Then we end up spending the next 50 years trying to get them to actually follow Christ as part of God’s flock. The measure of your salvation in all of these “false convert” warnings lies with YOU and YOUR work, not in Christ and HIS WORK. The work lies upon your degree of commitment or involvement. Do you really believe, have you completely turned from your sins, do you actually hate ALL of your sins, are you truly following Christ? Based on these types of questions and warnings, a person is left to turn inward to himself, and not outward to the cross of Christ and his empty tomb. Do I really believe? What does that mean? Do I ever have doubts? Do I ever question God’s calling in my life? Is my entire theological system 100% correct, free of all errors? Are there miracles accompanying all my prayers? Have I been bitten by a poisonous snake and not harmed at all? Have I completely turned from my sins (often worded as truly repented)? What does that mean? Does it mean I hate every single one of my acts of sin? Can I even enumerate all of my acts of sin? God forbid, but what if I fall into some sort of horrible cycle of sin, such as what King David and Samson did? Were they not truly repentant because of those nasty spills of temptation and failure to resist? Is it even possible to completely turn from my sin in this life? Won’t I always have sin in this life? And since I know I will always have sin this life, how many sinful acts are too many for me to have completely turned from my sin? Am I truly following Jesus? Let’s see… Am I holy as he is holy? Do I always pray for and love my enemies? Do I ever have hatred in my heart, or lust? Do I ever covet my neighbor’s house, or my boss’ salary? Do I have one too many coats? Do I always do the things that Jesus would want me to do, just as he was always doing what his Father wanted him to do during his time here on earth? Do I ever go astray like the dumb sheep of Psalm 23? Do you get my point?!!? Are any of us really, truly, completely (fill in the blank) so that we are deserving of salvation because we have (fill in the blank)? Are any of us even capable of properly making these judgments about ourselves? And I know for certain no other man can know my heart! So please, don’t get sucked into justifying yourself, or trembling that you aren’t doing enough to prove yourself a true convert. So how does conversion take place? A person hears the Gospel and believes. It’s that simple. Conversion occurs instantaneously, as does our justification. Sanctification however is a process, in which we will become more and more like Christ, likely sin less, and grow in faith and love more and more, etc. But that process will never be complete in this life… NEVER. When we die and are raised at Christ’s return, we will then receive heavenly bodies – that are sinless. As for now, we will always struggle between our new nature in Christ and our sinful nature that we inherited at our conception (Romans 7). And our justification is not dependent upon how we are progressing in sanctification! Our justification always comes by grace through faith in Christ. 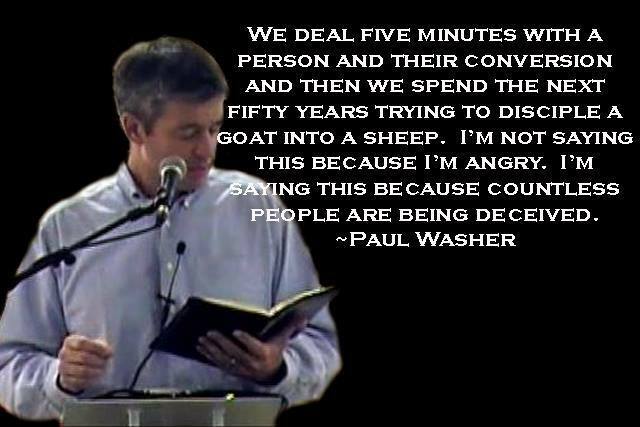 I absolutely love that Paul Washer explanation of how a person is converted and how we should lead a person to Christ! I hope you watched it. His explanation shows that conversion is not saying a prayer or making a decision. It’s simply faith coming to a person through hearing the Gospel message proclaimed, just as Paul says it does in Romans 10. After we have faith, we do pray, we do decide to follow Christ, etc. Perfectly? No. Never, not in this sinful body. Should the quality of my obedience dictate my salvation? No. Never. The perfection of Christ’s obedience dictates my good standing before the Lord, and Jesus was obedient unto death – even death on a cross! Do you note what happened here? Not everyone who prophesies in Christ’s name and drives out demons and performs miracles will be saved. Why? I think it is because they were justifying themselves. If Jesus ever said to me, you can’t enter heaven, I won’t respond with, “But Lord, did I not (blank), (blank), and (blank) in your name?” No! I will say, “But Lord, did you not take on flesh and humble yourself to live amongst us in order to fulfill all righteousness for me? Did you not die as an atoning sacrifice for my sins? Did you not rise from the dead, conquering sin, death, and the devil?” Do you see the difference? The ones who did not know Jesus, pointed to themselves and the work they did in Christ, not recognizing that they are evil-doers. The one who knows the Lord will point to Christ alone for his salvation. The point is that we are all evil-doers. We don’t deserve salvation. We deserve hell. So let’s not make salvation (or our conversions) about how well we are following Christ, how committed we are to the one True Lord, how much we hate our sins, or how much fruit we are bearing. Let’s always beat our breast and proclaim how wretched we are and that we need Christ to justify us! Spiritual Baptism Proponent: Do you believe baptism saves? Me: Yes, 1 Peter 3:20-21 says that the waters of Noah’s day symbolize the waters of baptism that now save you, and they save you through the resurrection of Jesus Christ. Spiritual Baptism Proponent: I’m not familiar with that passage. Me: You should read it. It’s in 1 Peter 3. The only time the word symbolism is ever used in the same sentence as baptism is that passage and the waters of baptism are not symbolic; it’s the waters of Noah’s day that are symbolic. Those waters symbolize the death and resurrection that we are connected to in baptism. Baptism saves, and it saves because of Christ’s death and resurrection. We are always saved by Christ’s death and resurrection. So this isn’t taking away from Christ’s work. Spiritual Baptism Proponent: I’m not familiar with that. I’d have to read that verse. Spiritual Baptism Propoenent: Yea, but that’s spiritual baptism. We receive all of that when we receive the Holy Spirit and faith. Me: I would agree with you. If a person hears the Gospel and receives the Gospel in faith, they are saved and have life and salvation. We are always saved by grace through faith in Christ. But how does that grace come to us? And is there anywhere in Scripture were we see the term “spiritual baptism”? I know we see “Baptism of the Holy Spirit” in Acts, which is something completely different. #1 – Does baptism save? #2 – Does everyone have to be baptized to be saved? Let’s first define baptism – based on Matthew 28:19, baptism is washing in the name of the Father, and of the Son, and of the Holy Spirit. Unless there is a clarifying word before or after baptism, such as “baptism by fire”, or “baptism of the Holy Spirit”, or “baptism of repentance”, or “John’s baptism”, we should interpret baptism to be referring to the baptism instituted by Christ, especially if we see the additional descriptors of, “Jesus’ baptism,” or “baptism into Jesus’ name”. Now, that baptism is defined, I want to introduce a term that may not be too common in many Christian circles: MEANS OF GRACE. Understanding MEANS OF GRACE will help answer both of these questions. According to Romans 10 how does a person come to be able to declare with his mouth and believe in his his heart? Vs. 14 asks how can they call on the one who can save them if they have not heard of him? The concluding answer is that they can’t until they have heard the Gospel (vs. 17). It is through the hearing of the Gospel that faith COMES. Faith COMES to us instead of us COMING to faith. Here is Paul’s language on that point found in vs. 17, “Consequently, faith COMES from hearing the message, and the message is heard through the word of Christ.” Flip all the way back to the beginning of the letter to the Romans and you will see that this is how Paul starts the letter – The Gospel is the power of salvation for all who believe (Romans 1:16). The Gospel saves. We hear the Gospel and through the Gospel the Holy Spirit gives us faith (this is another point I’ll have to tackle in another post). This all fits into Ephesians 2:8 in which we are told that salvation is by grace through faith and this is not of ourselves but the gift of God. Grace is “God’s Riches At Christ’s Expense.” By his life, death, and resurrection we have been forgiven, but all people are not instantly saved. That Grace must come to us somehow. The Gospel is one MEANS OF GRACE by which Grace comes to us, though we only receive the benefits of it through faith in the Gospel promises of God. I think all Christians would agree that Grace comes to us via the Gospel and that unless one has faith in the Gospel, there is no eternal life for that individual that has rejected the Gospel upon hearing it. NOW… is that the only MEANS OF GRACE, is the Gospel the only way we may receive the forgiveness of sins? To Question #1, I would say YES – Baptism saves! God has promised to work forgiveness of sins through baptism. That means that Grace comes to us in baptism (water applied to a person in the name of the Father, and of the Son, and of the Holy Spirit). To support that baptism saves, I point people to 1 Peter 3:20-21. Here the waters of Noah’s day are said to symbolize the waters of baptism that now SAVE YOU. How does it save? Look at verse 21 – “It saves you be the resurrection of Jesus Christ.” Baptism is not symbolic here, the waters of Noah’s day are symbolic. 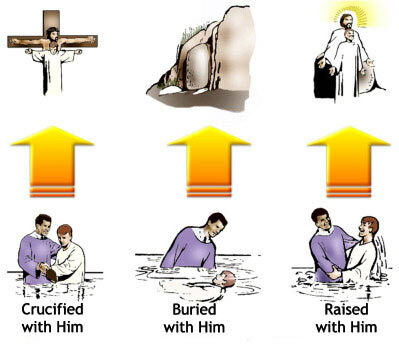 Baptism saves by the resurrection of Jesus Christ. Romans 6 clearly explains how in baptism we are buried and raised with Christ. It’s not just Peter that says this, but Paul too! TO Question #2 – NO – We don’t have to baptized to be saved! Grace comes to us through the MEANS OF GRACE – the Gospel and Baptism (and communion, but that’s another topic). If a person hears the Gospel and believes, faith and salvation has COME to him. He is saved. If that person is never baptized, he still has received grace through faith. If a person is baptized and believes, faith and salvation has COME to him. So is everyone saved who is baptized? NO! Just as the benefits of hearing the Gospel are received through faith, so TOO the benefits of the promises of baptism are received through faith alone. Technically, everyone receives the forgiveness of sins in baptism, just as everyone receives the forgiveness of sins through hearing the Gospel, YET, the benefits of God’s Grace are only received through faith in his promises. Hence it is so crucial to stick to Paul’s phrase, “by grace through faith”. Just grace and no faith – NO salvation. Just faith – NO salvation. It is when we have faith in a trustworthy object of salvation we are saved. The object in this case is a person and his work that for his sake, we have an all sufficient Savior, Jesus Christ of Nazareth.